Reading About the World, Volume 1 , edited by Paul Brians, Mary Gallwey, Douglas Hughes, Azfar Hussain, Richard Law, Michael Myers Michael Neville, Roger Schlesinger, Alice Spitzer, and Susan Swan. This anthology prints short selections sharply focussed on major topics of interest to beginning students of World Civilizations. It combines traditional historical sources with literary and philosophical selections. By clicking on the hotlinks below you can access samples from Reading About the World, Volume 1 . The third edition was published in 1999 by Harcourt Brace Custom Publishing. 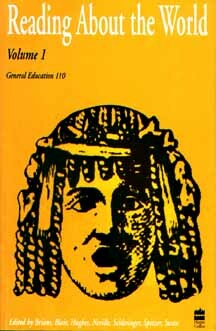 Early Greek Philosophers, brief selections from the presocratics, etc. Lady Horikawa: Will he always love me? *Selections marked are supplementary readings omitted from the 2nd edition of Reading About the World . All other queries should be directed to Paul Brians at paulbrians@gmail.com.